Former Irish international footballer, Eoin Hand has released a CD in aid of the Irish Guide Dogs for the blind. Hand, who also managed the Republic of Ireland team in the 1980's, launched the 14 track recording in the Brazen Head pub in November 2009. The Brazen Head, the oldest pub in Dublin, was also where Eoin Hand was born in 1946. His mother Monica, who died in May 2009, ran the pub during the 1930's and 40's. Hand recorded the CD in memory of Monica. Eoin Hand played schoolboy football for the famous Drumcondra soccer club Stella Maris. After a very brief spell with English club Swindon Town he returned to play in the league of Ireland for Dundalk, Shelbourne, and Drumcondra FC. In 1968 Hand signed for Portsmouth FC and went on to notch up a total of 277 appearances for the south of England outfit. During his time with Portsmouth he won the first of 19 caps for the Republic of Ireland senior football team. Belgium Ireland lost out on qualification on goal difference. After two further qualification campaigns Hand was succeeded by Jack Charlton. 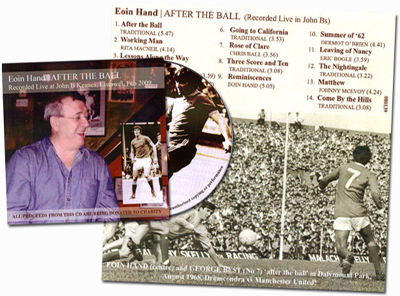 Recorded in John B Keane's pub in Listowel After The Ball contains 14 tracks, twelve songs and two of Eoins own recollections Lessons Along the Way and Reminiscences. The inside sleeve is a collector's item and includes photos of Eoin in the company of George Best, Jack Charlton, Luke Kelly and Ron Greenwood amongst others. Tracks include Working Man by Rita MacNeill, Rose of Clare by Richard Ball, Summer of '62 by Dermot O'Brien, Leaving of Nancy by Eric Bogle, and Matthew by Johnny McEvoy. It also includes traditional gems such as After the Ball, Going to California, Three Score and Ten, The Nightingale, and Come by the Hills. Mickey MacConnell, renowned musician and famous for writing Only our rivers run free helped to produce this outstanding live recording. number of clients. The Irish Guide Dogs for the Blind could really do with the support of the Irish soccer public so why not pick up a copy - or two - of Eoin Hand's After the Ball for a suggested donation of just €15 per copy.